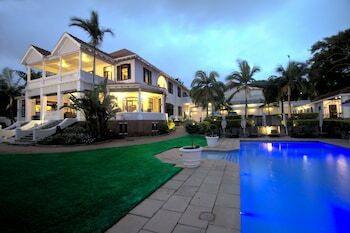 With a stay at Audacia Manor Boutique Hotel in Berea (Morningside), you'll be within a 15-minute drive of Sahara Stadium Kingsmead and uShaka Marine World. Featured amenities include limo/town car service, a computer station, and complimentary newspapers in the lobby. Planning an event in Berea? This hotel has facilities measuring 377 square feet (35 square meters), including a meeting room. For a surcharge, guests may use a roundtrip airport shuttle (available 24 hours) and a train station pick-up service. When you stay at Magalies Manor in Magaliesberg, you'll be 13 minutes by car from Maropeng. The front desk is staffed during limited hours. Free self parking is available onsite. Located in Knysna (Paradise), Lagoon Breeze is within a 5-minute drive of Knysna Quays and Knysna Elephant Park. Free self parking is available onsite. With a stay at Ilawu Inn in Pietermaritzburg, you'll be within a 5-minute walk of Pietermaritzburg City Hall and Tatham Art Gallery. A roundtrip airport shuttle is complimentary during limited hours. With a stay at 4 on Highworth in Cape Town (Sea Point), you'll be within a 15-minute drive of Cape Town Stadium and Two Oceans Aquarium. Limited parking is available onsite. When you stay at this apartment in Stellenbosch, you'll be in the suburbs, within a 10-minute walk of Dorp Street and Toy & Miniature Museum. Free self parking is available onsite.